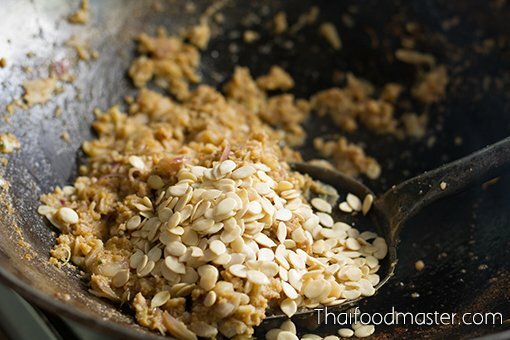 Khanohm faawy has been forgotten; maybe because the mung bean and sweet coconut filling is almost identical to another popular Thai dessert, golden jackfruit seeds (met khanoon, ขนมเม็ดขนุน). 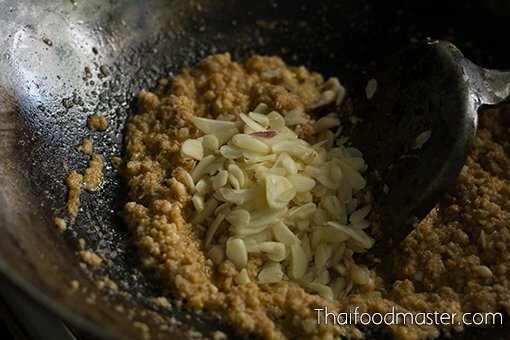 Perhaps to differentiate it from the golden jackfruit seeds dessert, a catchier name was coined: khanohm handtraa, which means to stamp a seal mark: the mung bean-coconut filling is shaped into small squares, and sometimes an indentation is made in the middle, similar to pressing a royal seal in wax. 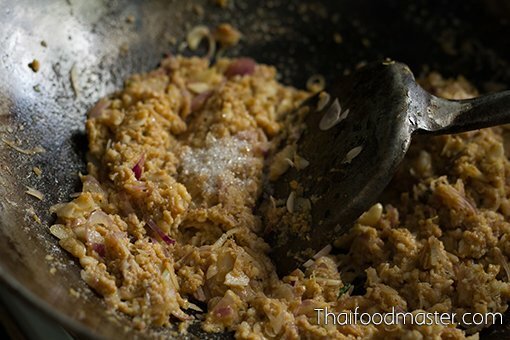 Indeed, some sources claim that this recipe came from Queen Sri Suriyendra (Princess Bunrod) of King Rama II. 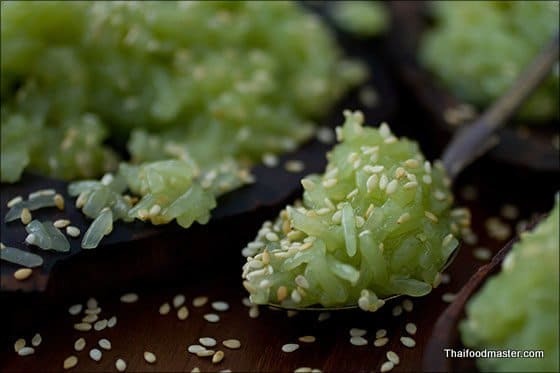 The first mention of the sweet version of khanohm faawy was in 1809, when King Rama I instructed the leader of the Thai Muslim community, Chularachamontree (Gorn Keaw) (เจ้าจอมหงส์ ธิดาพระยาจุฬาราชมนตรี, ก้อนแก้ว), to arrange refreshments for the auspicious celebration of the Temple of the Emerald Buddha (Wat Phra Kaew), to which 2,000 monks were invited along with many other guests. 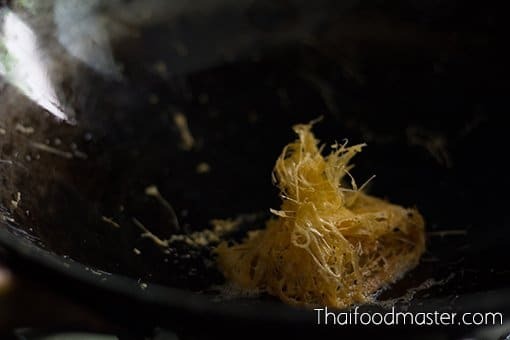 Fried crispy dough sticks (khanohm sai gai , ขนมไส้ไก่), sweet translucent gelatinous rice (khaao niaao gaaeo , ข้าวเหนียวแก้ว), small Thai cookies (khanohm phing , ขนมผิง), thin crispy fried bananas (gluay chaap , กล้วยฉาบ), egg thread pockets filled with shrimp and pork (laa dtiiang , ล่าเตียง), thin omelet filled with shrimp and pork (room , หรุ่ม), Thai coconut custard (sang khayaa , สังขยา), golden yolk threads in sugar syrup (faawy thaawng ,ฝอยทอง) and steamed coconut custard in small porcelain cups (khanohm dta lai , ขนมตะไล) and, finally, khanohm faawy (ขนมฝอย). 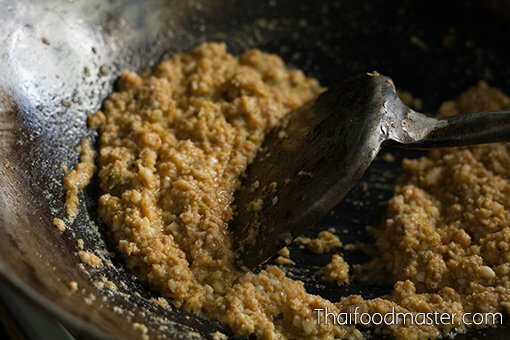 It is thanks to Lady Plean Passakornrawong, who included the recipe for khanohm faawy in her 1908 cookbook, Maae Khruaa Huaa Bpaa (แม่ครัวหัวป่าก์, book 1 chapter 57 page 135), that we can prepare the dish today. 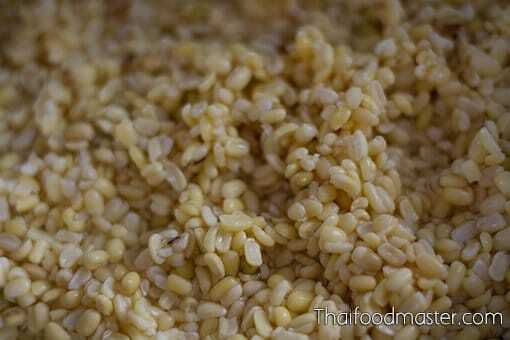 Soak the mung beans in water overnight. 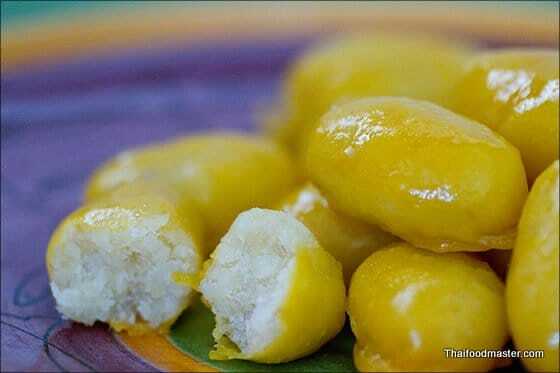 Gently squeeze the beans between your fingers to separate the beans from the husk. 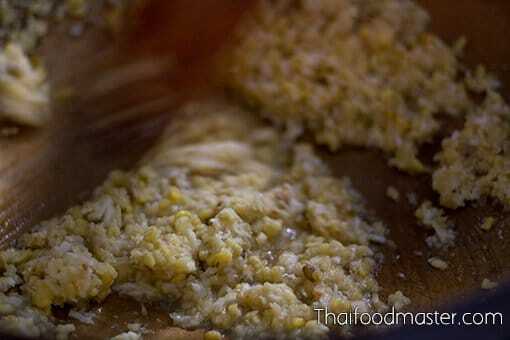 Cook the mung beans in water, in the same way you would cook rice. 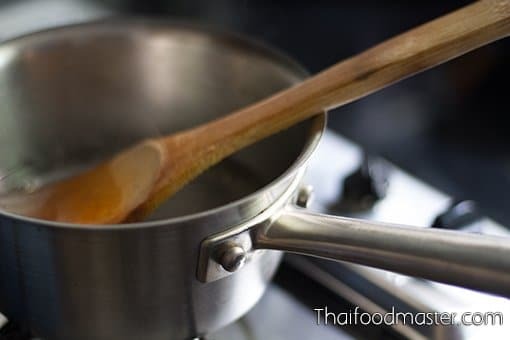 Prepare simple syrup by boiling equal quantities of water and white sugar. 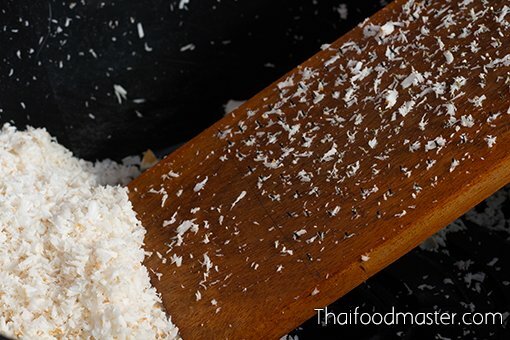 Grate the coconut using a Chinese grater. 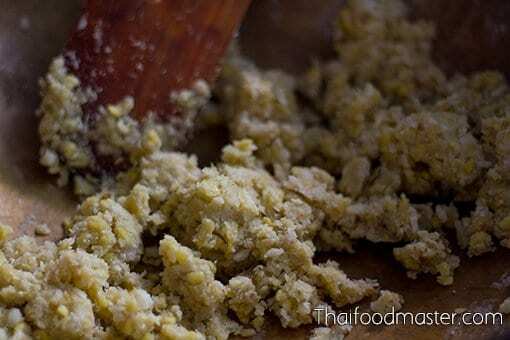 With your hand, knead the mung beans together with the grated coconut. 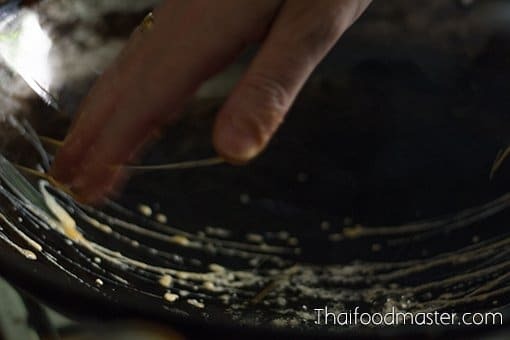 Place the sugar syrup, along with the mung bean and coconut mixture, into a brass wok; add a pinch of salt, and mix all the ingredients together over low heat, using a wooden paddle. 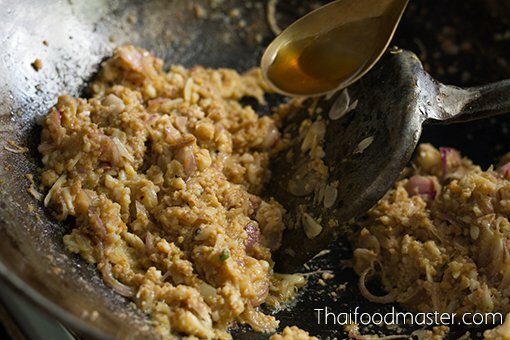 Stir constantly, making sure that the mixture is not sticking to the bottom of the wok. 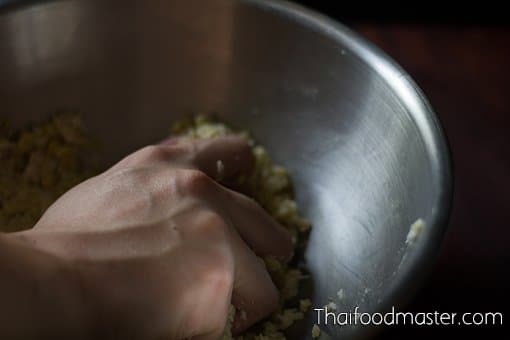 You will know that the marzipan is ready when you can roll it into a ball without it sticking to your fingers. 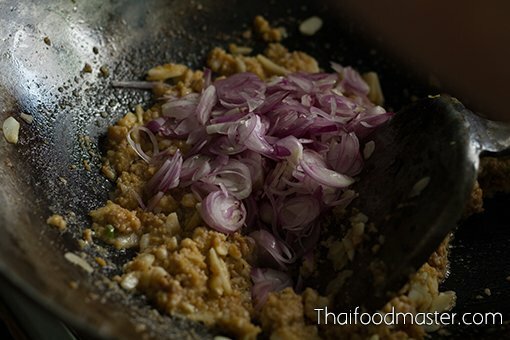 Turn off the heat. 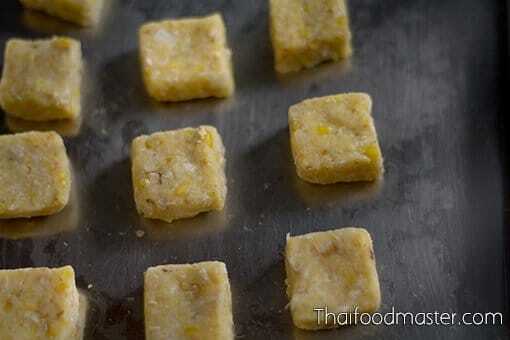 Shape the marzipan into small square shapes. 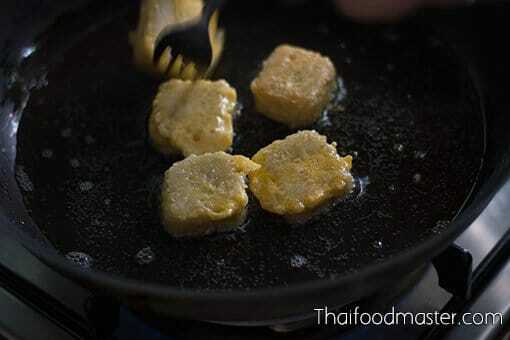 Dip the marzipan squares into duck’s egg yolks, and fry from all sides until golden. 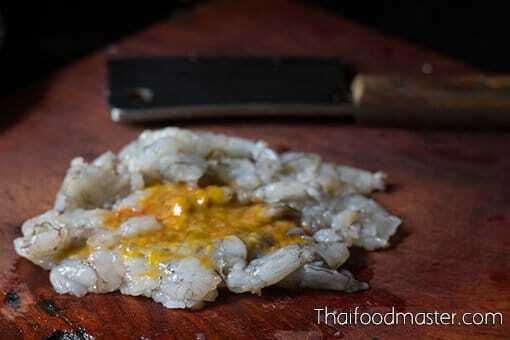 Set aside on a kitchen cloth. 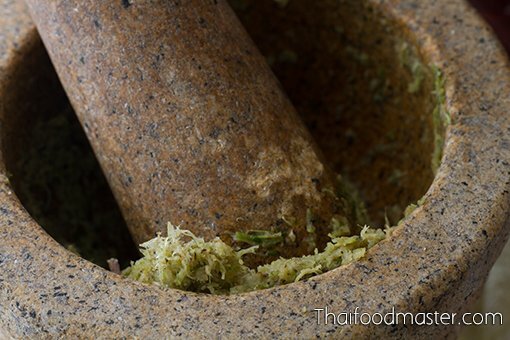 In a pestle and mortar, pound together coriander roots, garlic and white peppercorns. 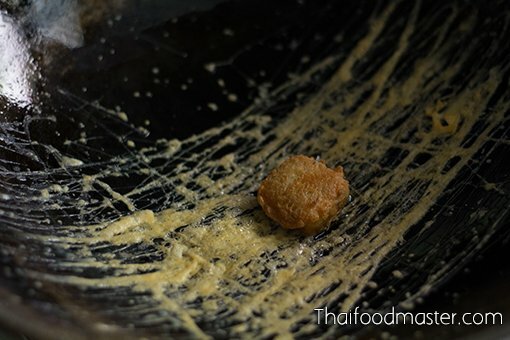 Peel and devein the shrimp, and flatten the shrimp meat with one slap of the knife; this will help make the shrimp meat fluffier. 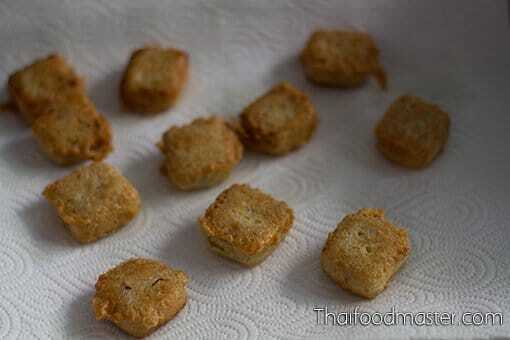 Collect the tomalley. 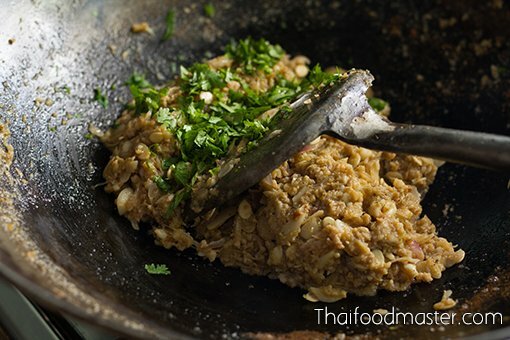 Mince the shrimp meat together with the tomalley. 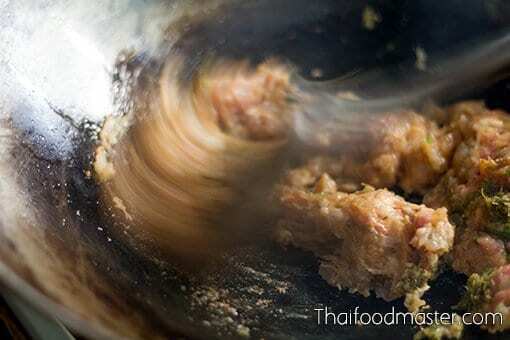 Mince the pork belly meat. 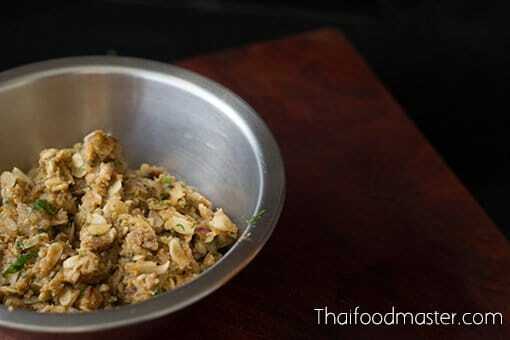 Mix the minced pork with some of the shrimp and garlic-coriander-white peppercorn paste. 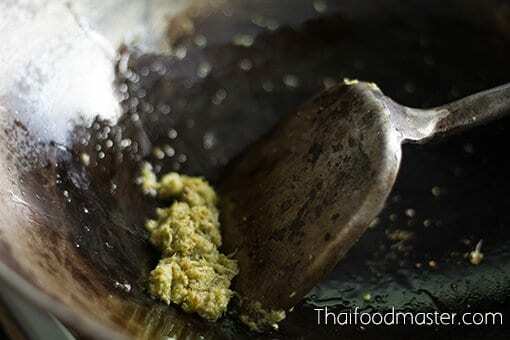 Place a wok with oil on medium heat; fry the garlic-coriander-white peppercorn paste until it is fragrant. 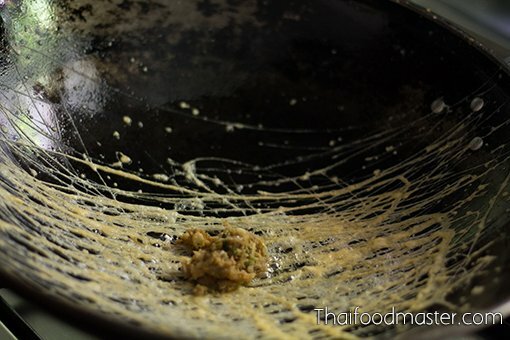 Beat duck eggs gently without incorporating any excess air, and then strain through a fine sieve. 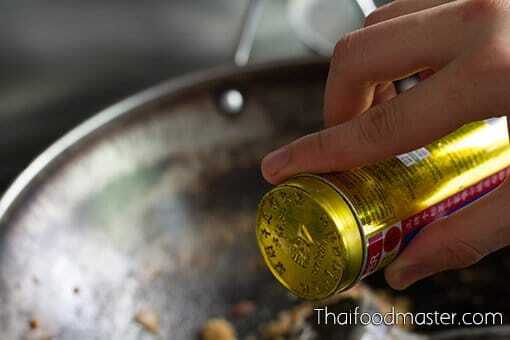 Heat oil in a work and turn off the heat. 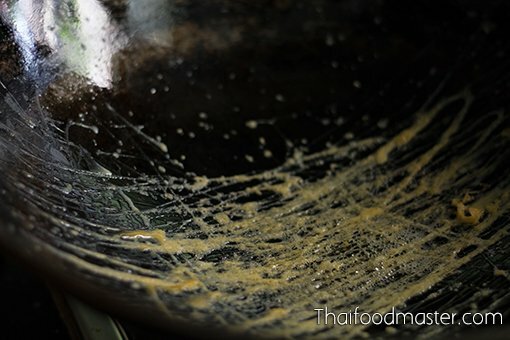 Wet your fingers in the egg and sprinkle thin lines of eggs on the wok while moving your entire hand quickly at the wrist. 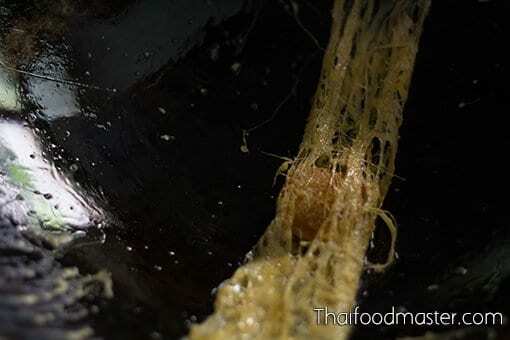 When a long nest has formed, turn on the heat again. 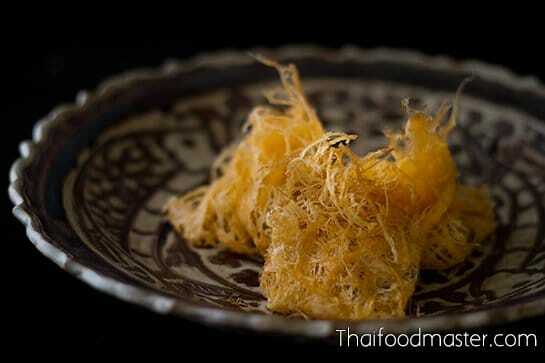 Wrap the nest. 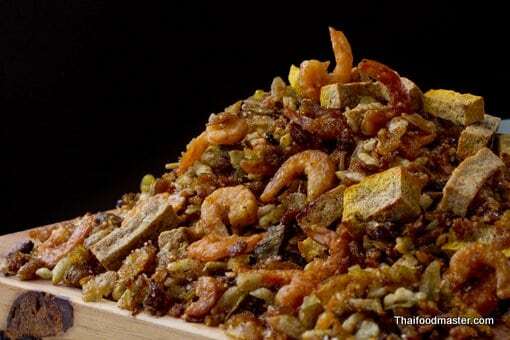 Start by bringing the sides of the nest together. 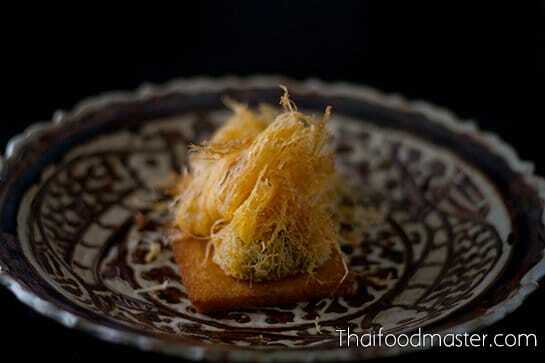 Serve the savory khanohm faawy on a piece of fried white bread.